Disparate themes of grief, alcoholism, recovery and the importance of stories intertwine seamlessly in “Imaginary Comforts, or the Story of the Ghost of the Dead Rabbit” by Daniel Handler of Lemony Snicket fame. Receiving its world premiere at Berkeley Repertory Theatre, this comedy-drama starts with mistaken assumptions between two people who meet on an online dating site. 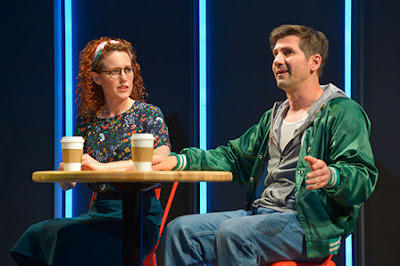 Naomi (Marilee Talkington), a rabbi, agrees to have coffee with Clovis (Michael Goorjian), because he checked Jewish as his religion. However, he meant to check none, which was the box next to Jewish. For his part, he was intrigued because he thought she had said she was a rabbit, not a rabbi. They don’t expect to meet again. Naomi is hired to officiate at the funeral of a stranger, Dr. Marcus Gold (Julian López-Morillas), an addiction therapist seen in flashbacks. His wife, Mrs. Gold (Sharon Lockwood), is grief-stricken. His adult daughter, Sarah (Susan Lynskey), is skeptical as the hapless Naomi tries unsuccessfully to learn enough about Dr. Gold to deliver the eulogy. Sarah is recently married to Michael (Cassidy Brown). Naomi similarly has no luck learning about Dr. Gold from his best friend and bookkeeper, Jack (Jarion Monroe). The funeral is a fiasco. As for the ghost of the dead rabbit, it’s part of a bedtime story that Dr. Gold used to tell Sarah. It also shows up in a playlet that Clovis, a recovering alcoholic, is developing with the help of the character called Ghost (the always irrepressible Danny Scheie). Various relationships develop. The cast is uniformly fine, but the talents of Lockwood as Mrs. Gold and Brown as Michael are wasted because their characters aren’t developed. Mrs. Gold merely sobs with virtually no lines. The same holds true for Michael, Sarah’s husband. He does little more than stand around although he does have one telling, nearly silent scene. Director Tony Taccone keeps the action flowing smoothly with help from the turntable in Todd Rosenthal’s set. It’s complemented by Nick Solyom’s lighting and Jake Rodriguez’s sound. The character-specific costumes are by Meg Neville. Though the show needs fine-tuning, it’s entertaining and absorbing. Running about 90 minutes with no intermission, “Imaginary Comforts, or the Story of the Ghost of the Dead Rabbit” will continue through Nov. 19 in Berkeley Rep’s Peet’s Theatre, 2025 Addison St., Berkeley. For tickets, call (510) 647-2949 or visit www.berkeleyrep.org.